Because Apple's desire is to sell products to everyone, Jony Ive met with great resistance inside Apple when he pitched his plan to release a luxury version of the Apple Watch priced at $10,000 and up. Some inside the company said that creating a luxury timepiece would produce a new high-end group of Apple customers which was something that most in Cupertino were not comfortable with. But Ive won the argument. Apple will be selling the Apple Watch in a range of $10,000 to $17,000 for its Apple Watch Edition, made with 18-karat gold that is twice as hard as standard gold. Since there will be units of the luxury models available at brick and mortar Apple Stores, the company has equipped each store with the same type of safe you would find in jewelery stores. Each Apple Watch placed in the safe will be hooked up overnight to a MagSafe charger so that they will be all ready to go for prospective customers to look at the next day. 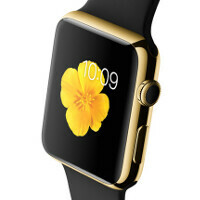 The Apple Watch Edition models will be sold differently than the Apple Watch Sport entry-level model. The latter timepieces are priced at $349. The more expensive watches will be housed during the day in a glass display case similar to where a jewlery store keeps its pricier goods. And you just might notice tighter security at Apple Stores. Losing a $700 iPhone in a robbery is bad enough. Getting jacked of a $10,000 gold watch is even worse. Was Apple's SVP of design right to push for such a luxurious version of the Apple Watch? If this does pan out for Apple, the question is whether we will see luxury versions of such devices as the Apple iPhone and Apple iPad. Apple sees its watch as a fashion product and a tech device. Why wouldn't it try working the fashion angle for its smartphone and tablet? Bendgate was an overblown issue. Try again. How was it over blown??? Ok I'll try again... Oh... it bent again.. Rubbish iPhone.. Rubbish iFan..
At least it's a real issue. Try again. Who in their right mind will waste that much money for something that'll be drastically improved in a year..
People who want the first Apple watch ever made. In time, the first iPhone will be a priceless sell, and the same will apply to the first Apple watch, similar to how it applies to the first Apple computers. Seriously, with 10k, I would rather buy a nice Rolex watch that can go up in value than something that can only run a day before needing a charge. And you better charge it in a secure place in case someone nick it. Silliness at its maximum. Agreed. The timeless value of an expensive watch is important. A friend bought a $40k watch and sold it a week later for $43k. Like this isn't an expansive watch having a timeless value... It's an Apple watch, the first sold golden Apple watches will be bidded by millions in few dozen years like some egyptian artifacts. Like old Apple conputers. "like some Egyptian artifacts" LOL!!! Now I am starting to understand why people associated sheep mentality so closely with apple fan. Egyptian artifacts are national treasure, i am very sure old junk gadget don't hold the same prestige. Penny, that's a very good point I hadn't yet thought of. A Rolex or Patek doesn't go obsolete. Properly kept and maintained and they hold their value, or even increase in value. This Apple Watch Edition will only be worth its melt value in a year or 2 whenever they release the newer version. A quality timepiece can last decades or longer. Nevermind obsolescence, the Apple Watch will only last until the battery craps out and the supply of replacements dries up. Actually Iodine in comment #12 does have a point. It is the first Apple watch, and there are enough fans and collectors of original technology items that the rarest Apple watches may have great value as a collector's item at some point in the future. Even if the battery craps out and the technology gets old, imagine a collector resurrecting it with new internal hardware and dubbing it a "modern classic" at that future time? When it comes to collectors' items, it's all about perceived value, not functional value. The 10k+ version will barely sell. Anyone with that kind of money usually isn't the person dumb enough to make those poor decisions. Some stupid NBA and NFL players will buy it to wear during their press conferences and that's about it. And prolly Floyd mayweather. He's also that stupid. If someone has enough money to casually spend $10,000, or $17,000 on a watch I would call that rich as opposed to stupid. Put it another way, for a hell of a lot of people that is the same thing as you or I spending $5. I'm not exactly sure why you think people buying stuff they like is stupid. I bought a Movado sapphire watch for roughly $1300, the one in my profile pic as a matter of fact. It wasn't a necessary purchase, but it was something I liked and could easily afford. I would assume the same logic would hold true of somebody buying an apple watch. Although yes, you would be right in the sense that there is that layer of longevity and long term monetary value that simply wouldn't be there with a SmartWatch that you would have with a traditional watch. Just saying, I don't think stupidity and wealth are identical. Entirely depends on what you value though. Terry, I agree that wealth and stupidity are not even remotely identical. Typically, those who have wealth did not get there by being stupid. DirtyDirty is clearly not very intelligent. If this watch was only going to be purchased by a few "stupid" basketball players and NFL players, then Apple would not make it. Apple is a multibillion dollar company that has some of the smartest minds in business working for it that forecast out sales for products like this. Regardless if you think this watch is ridiculously overpriced ( like me) or a value, it will sell because there will be people who want to purchase this and have the income to do so. Exactly. Even if it was for no other reason than bragging rights, there are plenty who can afford to buy this watch and will do so. I do think it's overpriced, but I also understand that many wealthy individuals value image and oneupsmanship more so than money itself. Or just the value of being one of the first to own something that no one else has. Either way. An Apple Watch isn't really image or oneupmanship for someone wealthy though, oinly for someone in the ghetto. For that you need e.g. Patek Philippe or other REAL watches with real workmanship behind them. For one, by your ignorant statement I severely doubt that you know all that much about the impoverished, the ghetto, or how ridiculous that scenario even sounds. Stereotypes aside, considering that half of America (and the world in general) is technically poor you are off base in your cliches. Secondly, I'm well aware of what the upper echelons of luxury timepieces consist of when it comes to brand power. My point wasn't about that, it was more about the fact that the Apple watch is a new device. And just like when the iPhone and iPad came out a lot of celebrities (be they from film, music, or now the web) will flock to it in order to show it off. That happens with pretty much any new and highly anticipated product. Especially from Apple. Keep in mind there are 12 million millionaires in the world. You're talking about the truly wealthy, businessmen, old money, and products that are mainly meant to be impressive to other people who already have money within certain cliques. The Apple watch isn't even in the same stratosphere either from price or brand, and you're really talking about time pieces that start at $100,000. An entirely different cachet of customers all together from what I was referring to. It was Jony Ive who's head knock on a wall as a result he gave this brilliant idea. Are you hurt or are you a fanboy who will pay 10k for a crap?